Market research revealed that about one third of the population has mouldy bathroom sealants but fears of a complex and time-consuming job has discouraged DIYers from undertaking sealant projects. 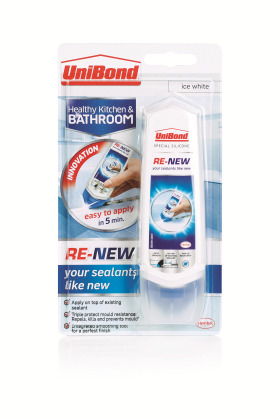 UniBond Re-New from Henkel is a simple and easy solution for everyone. No need to remove the old sealant, the company says, just apply on top. There are no additional tools required: an auto smoothing tool is built into the design, and it covers and stops existing mould and prevents future growth thanks to Triple Protect Anti mould protection. Unibond Re-New also covers cracks in the sealant thanks to perfect adhesion to all silicones, says Henkel.